If you’ve been reading our blog for the past few months, you know that we have a love for organic gardening with heirloom seeds. You also have probably figured out that we serve our guests delectable treats made from scratch on a daily basis, using local ingredients. Our guests RAVE about our signature biscuits–and so today we are revealing the story behind them–and our recipe! Before we do that though, we’d like you to know how proud we are of these breakfast goodies. We were recognized byVirginia.org as one of ten B&Bs having a Notable Breakfast in Virginia. Last year we made it to the FINAL four for theBedandbreakfast.com Breakfast Contest. We were representing the Southern brackett. That was great fun! 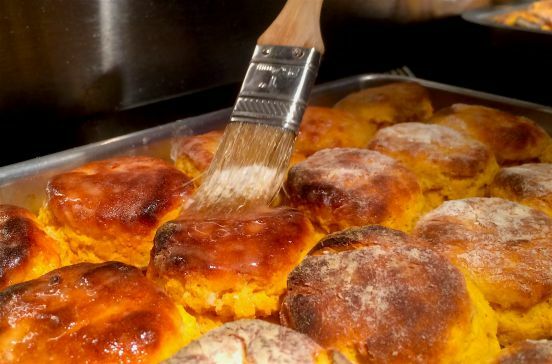 Our fluffy Sweet Potato Biscuit recipe has a fascinating history that actually starts with Thomas Jefferson! In 1774, his Sweet Potato Biscuits were served at the first meeting of the First Continental Congress at City Tavern in Philadelphia. They are still served there today. Now, our recipe does have a twist to his original version, and we’d like to share a funny story with you. The first few times we made these biscuits, they tasted wonderful, but they didn’t look so appealing. In fact, they looked like they were filled with hairs! It was quite alarming, and that was when we learned that we must puree the sweet potatoes prior to baking due to their fibrous nature. Can you imagine serving hairy-looking biscuits to our guests? Sweet potatoes grow very well in our loamy soil on the shore. Take a journey through the photos as you watch Innkeeper and Jim Jim the Biscuit Man work his breakfast magic. The dough has been prepared, rolled out, and Jim is carefully cutting the biscuits. Next, the biscuits are baked and brushed with butter. Biscuits are topped with homemade Ginger Fig Jam and slices of Virginia Edwards Ham. 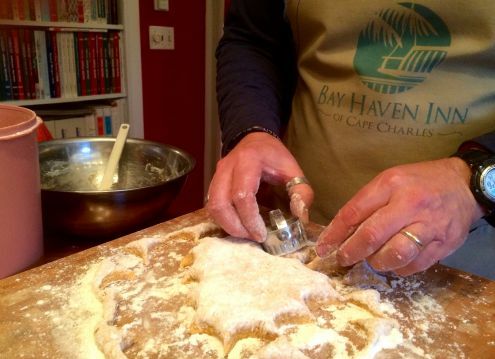 When you arrive for breakfast, not only can you expect our signature biscuits, but they will be served with the Bay Haven Inn of Cape Charles Eastern Shore Coastal Roast coffee and plenty of other garden-to-table goodies! Want to make some of your own? Here’s our recipe–let us know how they turn out! 3) Fold the wet ingredients to dry ingredients and do not over mix, just enough to hold together. 4) Dust a pastry board, divide dough in half and work with one ½ at a time. Spread out dough to ½ inch thickness and flip over to dust it with flour again. 5) Take 2 inch biscuit cutter, dip in flour and cut in first biscuit, repeat process making sure to dip in flour each time. Bake at 450 for 15-20 minutes, watch closely varies based on oven. We serve with a thinly shaved Edwards Virginia country ham and add a light layer of apricot or ginger/fig jam to create the perfect bite. 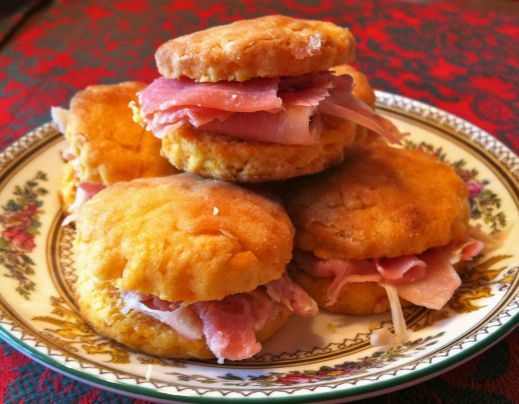 * I am not sure where adding the country ham came into the picture but it is definitely the perfect mate to the Sweet Potato biscuit, add a our homemade Ginger Fig or peach pepper jam and you have created the perfect, most memorable bite! Recipe derived from the Thomas Jefferson’s original Sweet Potato Biscuits served at City Tavern and Susie H. Mapp, Eastern Shore homemaker. Thank you for sharing this recipe for sweet potato biscuits. I am looking forward to making them. You’re welcome! I hope you enjoy them. It’s a great recipe! Please share a photo of your results and tips you learned along the way!